Dr Greg Coates has been the RWAV Clinical Lead for GP Anaesthetics training in Victoria. We spoke to Dr Coates about the need for an equivalent Clinical Lead for GP Obstetrics training and what the position has to offer for GP Obstetricians. How long have you worked as the RWAV Clinical Lead for Anaesthetics? I have been doing this clinical lead role for two years now. How do you think the clinical lead in obstetrics could contribute to the health of rural communities in Victoria? General Practitioner (GP) Obstetricians and GP Anaesthetists go hand in hand in many parts of rural Victoria. The way I see it, the main reason operating theatres remain open and the on-call service remain intact is often dependent on a functioning maternity service. Lose the obstetric service, then lose the need for on-call. Lose the on-call then elective anaesthetic lists go to fly-in-fly-out specialists. At which point, the emergency department goes unsupported when sick patients arrive after hours. The GA anaesthetists deskill or leave town. Then pathology and X-ray close and you might end up going from a dynamic, pluripotent rural hospital to a glorified day suite or nursing home. It has happened many times. Bit of a house of cards. Remove one component and the rest can fall quickly. Often the rural obstetrics roles are the most challenging positions to fill. What qualifications would help someone be successful in this role? I think an existing rural GP obstetrician is the right person for the job rather than a consultant obstetrician. Are there opportunities to support others in these clinical lead roles? Obstetrics is still very vital. There are lots of good stories, especially about delivering babies and the importance of babies in the lives of families. GP obstetricians can deliver generations of families. There are opportunities for the clinical leads to select and encourage candidates to take specific pathways that will help their careers. A good clinical lead would be happy to share his or her experience to guide them. From your perspective, are there any similarities in how you have been able to help your peers in this role and how the clinical lead role for obstetrics could do same? While there are some similarities, the training structure is different. For obstetrics, the training is more streamlined; there is a national exam and diploma. For anaesthetics, every hospital does the anaesthetics training differently. There is a lot to learn in only 12 months and the best training is contextualised to rural circumstances. The next step for anaesthetics is a national diploma and that is likely to be introduced in the next 12 months. Fortunately, enhancements to GP obstetrics training are open to fellowed GPs (not just GP registrars). This has been a smart, strategic change. The result is that working GPs, who have passed their fellowship exams, can now go back to their rural practices and begin practicing obstetrics in their local and neighbouring hospitals. It’s a great opportunity for those who want to spice up life in the country and want to do more at their local hospital. There needs to be a Clinical Lead for Obstetrics to enable more GPs to take advantage of these opportunities. 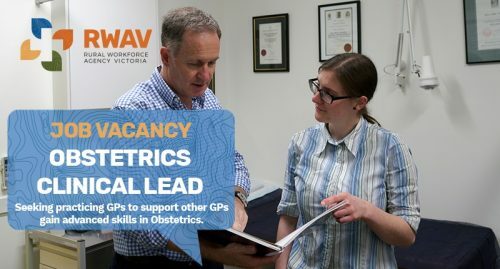 If you are interested in learning about more about the Clinical Lead for GP Obstetrics role with RWAV, candidates are invited to review the job description, contact Fatima Souki at fatimas@rwav.com.au or phone 03 9349 7800. RWAV acknowledges the funding provided by the Victorian Government Department of Health & Human Services under the Rural Extended and Advanced Procedural Skills (REAPS) Program.